JPL's RoboAthlete rover prototype tackles a hill in trials. 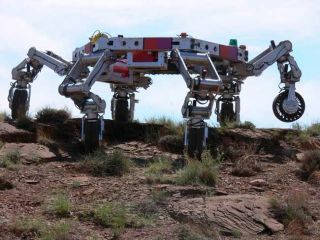 The ATHLETE(All-Terrain Hex-Legged Extra-Terrestrial Explorer) robot could play an essentialrole in new lunar bases. According to NASA, the 15 ton lunar habitat would be mountedon top of the six-legged robot. The habitat could walk right off of the lunarlander, and then proceed to any desired location. Wheeled locomotion would beused for level ground; more challenging terrain could be negotiated with thefull use of the flexible legs. The ATHLETE-basedhabitat could then be controlled directly by astronauts; mission control couldalso direct the habitat from Earth. My favorite alternative, an autonomousrobot habitat, is also slated for testing. It would use software developed forthe Marsrovers Spirit and Opportunity. The robot habitat would move around using power drawn fromsolar arrays; the maximum speed is about 10 km/hour. Although this seems slow,remember that the Moon's circumference is just 11,000 kilometers (compared toEarth's circumference of 40,000 km). Astronauts would live a nomadic existence,covering much more of the lunar surface. NASA engineers are testing two prototypes of the roboticlunar base in Pasadena, CA. Abandoning the idea of a fixed lunar base would be a hugeshift for NASA (and maybe the rest of us). Instead, astronauts would lead anomadic existence; this would let them cover vastly more ground in exploration. Even better, the robot habitat could even help out; take alook at this videoof the ATHLETE robot attaching tools to its flexible legs Transformer-style. Once NASA settles down and starts working on future designs,perhaps a walking lunar base might resemble this "crab fort" drawn byDaniel Dociu (see picture). In terms of movement, it reminded me of the slow-but-steady steel tortoise,from Robert Heinlein's 1940 novella Coventry; this vehicle was alsosolar powered, and crawled along at a top speed of just six miles per hour. This is a big change from the static location moon base;this idea has been a staple of science-fictional Moon exploration since the moon domes of RayCummings 1931 novel Brigandsof the Moon.